While I do enjoy reading nonfiction if it's something that I'm interested in, this isn't necessarily the reading material I immediately reach for. I never have a goal in mind when reading nonfiction, but I do read a few within the year and I would like to actively seek it out more this year and spend more time reading it. 2. Finish Eye of the World. When my husband and I were first married, we agreed to read a book from the other's favorite author. At the time, my favorite author was Jodi Picoult, so he chose Salem Falls and did actually read it. His favorite author has always been Robert Jordan, so I was supposed to read Eye of the World, the first book in the Wheel of Time series. That was over ten years ago and I have yet to finish it! I finally started it last year and got about 25% of the way through; however, it really is dense reading and I ultimately got distracted. But it's really time I upheld my end of the bargain and who knows maybe it will become my favorite as well! 3. Engage in another hobby/activity that doesn't involve reading or books. Any spare time that I end up having generally goes towards activities that revolve around books or reading. And while this isn't a bad thing, when you hit the wall of a massive reading slump, what do you do? Between planning learning activities for the boys, writing posts, taking pictures of books, talking about books in my book club, visiting libraries and bookstores, watching videos on Booktube, and spending time browsing for books online, I am honestly burnt out right now. It doesn't help that my energy level is at rock bottom, but perhaps if I found some time to focus on a few activities that had nothing to do with books or reading, a reading slump would not feel like the end of the world. I used to cross-stitch and work out, so maybe it's time to try things like that again. 4. Commit to a book buying ban. I have a lot of books on my TBR shelf. So many that it's actually quite embarrassing to admit how many books that I have purchased that I have not read. I did commit to a ban in 2015, so I know that it's possible. I need to spend time reading the books I have because I have no more room at this point to acquire any more. I need to read the ones that I have and either keep them to read again or get rid of them to make room for new additions. If you follow me on Facebook or Instagram, then you know that we found out we will be welcoming a new bookworm into our family later this year. My husband will also be deploying to Afghanistan this month and will more than likely not be there for the birth. I also have our family business matters to attend to, so needless to say, this is going to be a very busy year. And while I like to be a self-sufficient person, it really is okay to understand that there will be times I need help and it's okay to accept it. For my own sanity, it's probably going to more important than I fully realize at this moment! 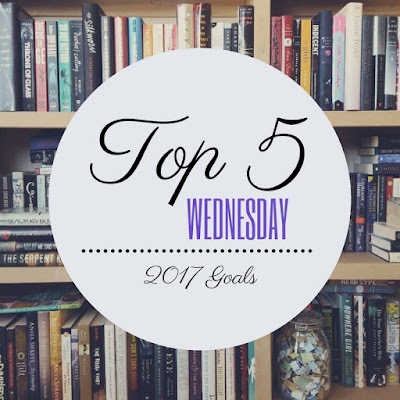 So those are my goals for this week's Top 5 Wednesday! What are your goals for 2017? Let me know in the comments!